Darts is a pub game most often played in the UK, the USA and the Scandinavian countries. The dart board is placed on the wall with the centre positioned 5ft 8in (1.73m) from the floor. Players take turns throwing 3 darts at the board from a distance of 7ft 9.25in (2.37m) marked by a line called an oche behind which their feet must remain. 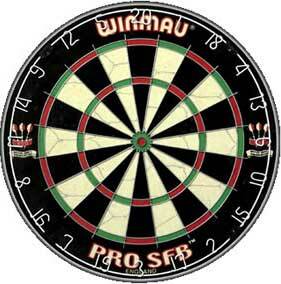 When darts land in either the white or black segments points are awarded according to the corresponding number placed around the edge of the board. If the dart lands in the outer red and green ring, double points are awarded. If the dart lands in the inner read and green ring treble points are awarded. Also the outer bull scores 25 and the inner bull or bullseye scores 50 points. The total score of 3 darts is taken away from the players current total, (usually starting from 501) with the winner of the game being the first player to reach exactly zero and finishing on a double. Below is the sequence of numbers found around the edge of the dart board starting at the top and moving clockwise. The sequence was devised by Brian Gamlin in 1896 to make dart throwing more of a skill rather than a game of chance. Generally high scoring segments are placed adjacent to low scoring segments so inaccurate throwing is penalised.